Angora cats originated in Turkey’s capital city of Ankara, formerly called Angora. The elegant felines are registered as Turkish Angoras in the Cat Fanciers’ Association and The International Cat Association breed listings. 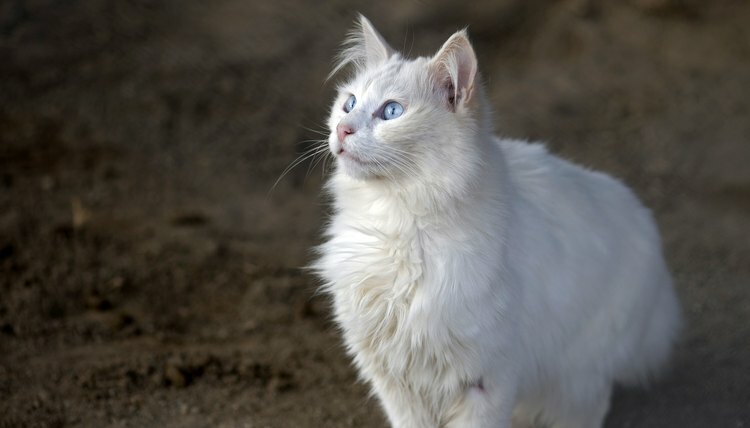 Like any other purebred cat, the Turkish Angora has her own unique set of identifying traits that make her an attractive and endearing companion. Turkish Angoras have semi-long hair, but prospective owners are rewarded with ease of grooming due to the single layer coat. Unlike a Persian, whose dense undercoat tends to mat easily and requires diligent grooming, the silky hairs of the Turkish Angora rarely form mats. Combing the coat on a weekly basis removes any dead hairs and maintains the coat’s luxurious luster. The hair length adjusts naturally with the seasons. During the winter months, the coat grows longer and thicker, and the hairs on the britches, mane and plumed tail appear fuller and fluffier. Although white has been the longstanding color choice of Turkish Angoras, the breed’s coat color comes in an extensive array of solids and patterns that are accepted in the show ring. Long and lithe, the regal Turkish Angora exhibits the picture of elegance and moves with grace and fluidity. Every feature of the Turkish Angora’s physique exhibits a perfect symmetry of long and fine dimensions. The medium-sized feline appears dainty with her fine bone structure and pointed face, but high power springs forth from the muscles within this little package. Turkish Angoras are agile and quick as they scale tall furniture and dart playfully from room to room. Contributing to the cat’s aristocratic appearance are a pair of large ears that stand erect and alert and a pair of large, almond-shaped eyes that are open and expressive. The eyes may be any color, and some Turkish Angoras have odd-colored eyes, such as one blue eye and one amber eye. Turkish Angoras are sociable and interactive cats. They are outgoing with household guests that acknowledge their presence and willingly interact with them. These loving cats are devoted to their owners and insist on playing an active supporting role in all household tasks and activities. They are affectionate, bond well with their families and get along well with children. They also get along with other household pets, but they will insist that they are the alpha ruler of the castle. Turkish Angoras are full of energy, agility and athletic prowess. Their exuberance for engaging in interactive activities compels them to demand your attention. The breed is always ready to play, initiate new activities, explore all nooks and crannies of their home and amuse owners with entertaining antics. The intelligent Turkish Angora’s inquisitive nature and insatiable need to participate prompts her to make all of your tasks her business. She is not above causing a little mischief to reap attention from her family members. For the Turkish Angora, a confident demeanor and commanding presence is not always enough to elicit the attention that she demands. Along with the Siamese and Tonkinese cats, the Turkish Angora is also a talkative breed. In their constant quest to interact with other members of the household, Turkish Angoras can meow and chirp a blue streak. They are vocal cats who captivate attention with animated displays of feline vocabulary. Her charming wiles and gift of conversation ensure that she shall not be ignored and that no family member will ever feel alone.